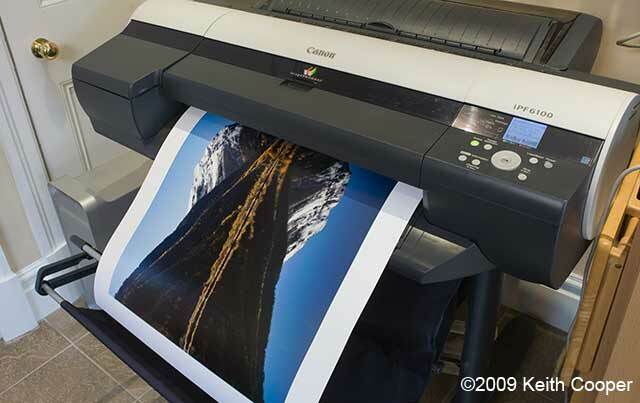 Canon UK lent us an iPF6100 large format printer for several weeks to review. 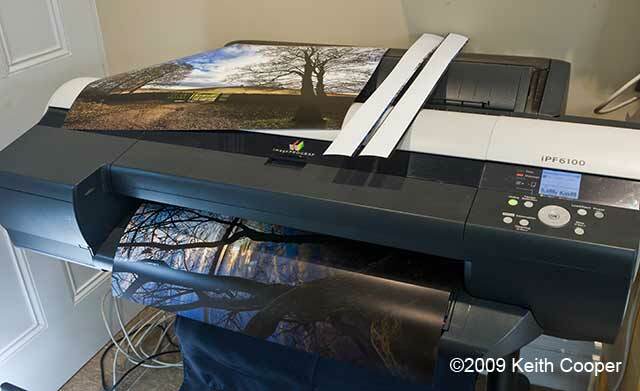 Keith has been seeing how it performs and has written up some of his thoughts on using this printer for fine art photographic printing. 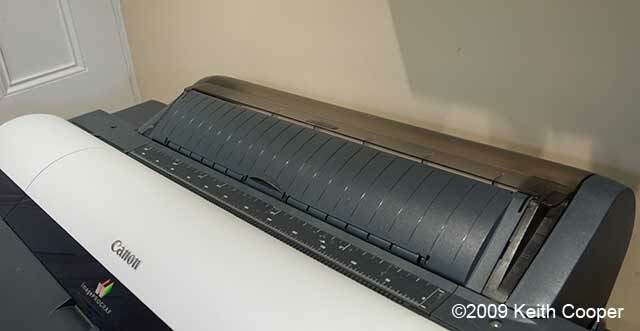 Keith’s review covers this 24″ width printer. 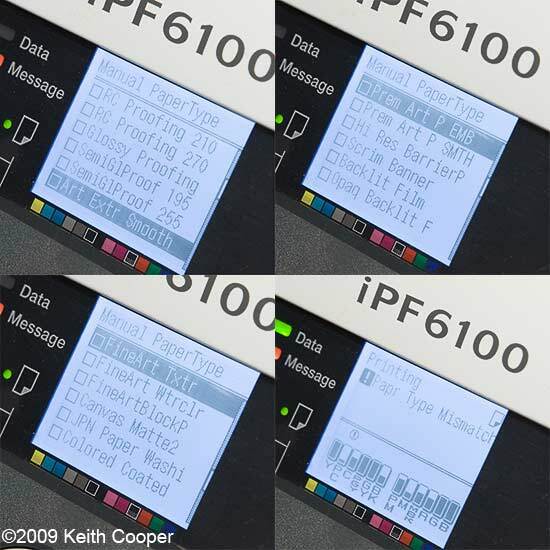 The iPF6200 is a 6100 printer with an 80 GB internal hard disk. For a larger 44″ width version you would have to look at the iPF8100. The review was carried out driving the printer from OSX Apple Macs. However the functionality and software is very similar if you happen to be using a Windows PC. Borderless A1 glossy prints in less than 4 minutes. I’ll have a look at how well it meets these claims later, but suffice to say, it’s a nice printer. There are full specificationsfor the printer at the end of this review. The printer itself is easily installed by two people, not that it’s particularly heavy, but it’s bulky and I wouldn’t want to lift it on my own. 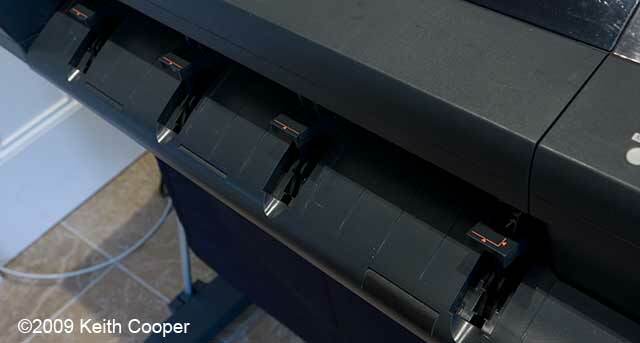 The stand is easy to put together, and the printer itself locates securely on the base. The printer is moderately quiet in operation, and silent when it enters power saving mode. The printer does have a front loading ‘straight through’ media path, which means that if you are using stiff media, then you should be sure to leave enough space at the back of the printer. 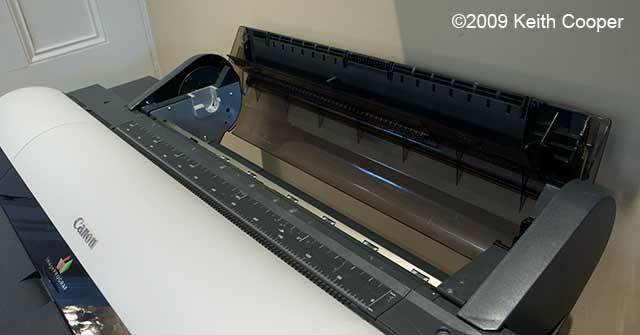 The printer has a built in cutter which is located at the very front of the printer, in a location potentially accessible to small fingers – as ever, be careful who uses a printer like this. The printer version I’m looking at is the iPF6100, which does not have an integral hard disk like the iPF6200. The picture to the right shows our printer being used for a panoramic image, which is heading for the fold out fabric print catcher attached to the stand. The set of coloured inks (LUCIA II pigment ink) is aimed at giving a wide even gamut of colours on a range of papers. 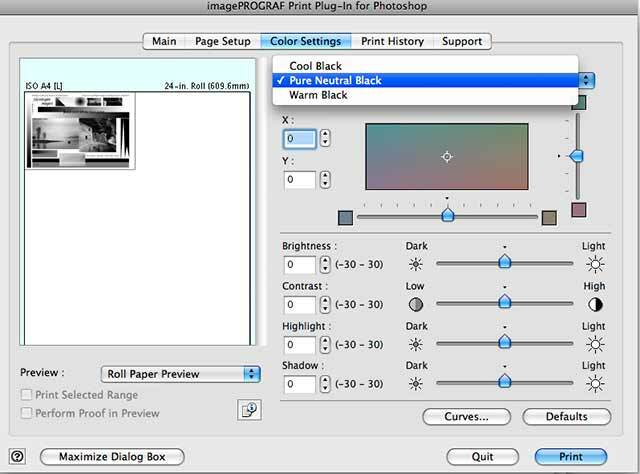 There are two black inks for ‘photo’ and ‘Matte’ media – these are permanently loaded, and there is no need to swap or change black ink settings, this is set by the media choice when printing. 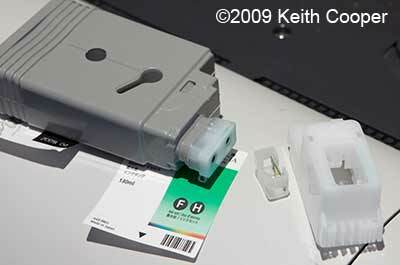 There is a choice of USB2 or Ethernet to link your printer up to a computer. There is also an optional Firewire (IEEE1394) interface board available. Drivers and additional software are supplied for Apple Mac and Windows. There is additional ‘Poster Artist’ software supplied, but since it’s Windows PC only, we’ve not covered it here. 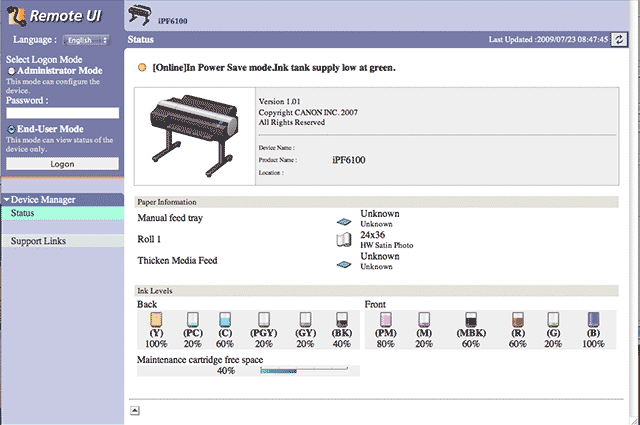 Other software allows for maintenance of available media types, both in the printer and driver. An on-line manual is installed and the printer has its own web interface (both covered in more detail below). The printer obtained an IP address for itself on our network, however you can alter this (for a static address) either from the control panel or by accessing the printer over the network. Paper type is set via the printer front panel. The menu system is quite clear, and I had no difficulty finding what was there. Roll paper is loaded at the back of the printer. 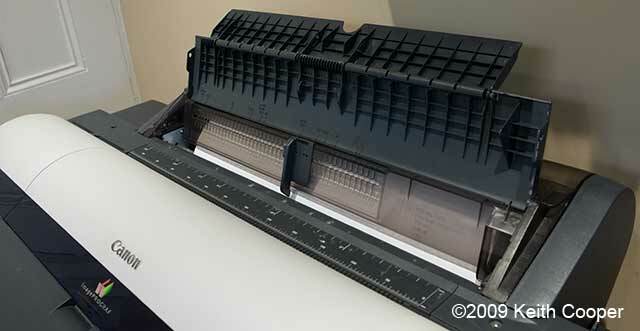 It’s loaded from the top, so you don’t need to move the printer away from the wall to load it. 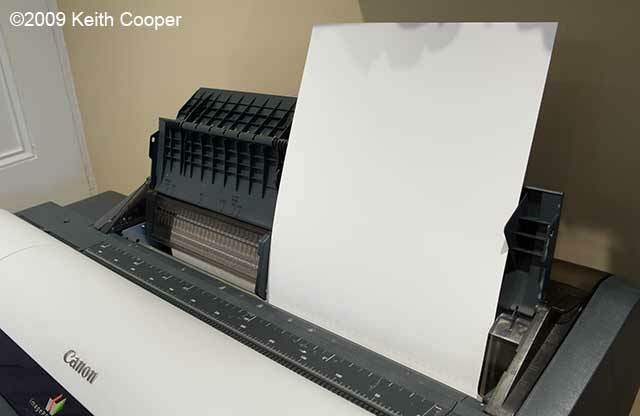 The feed is motorised, so you need only feed the paper part way into the printer for it to load. 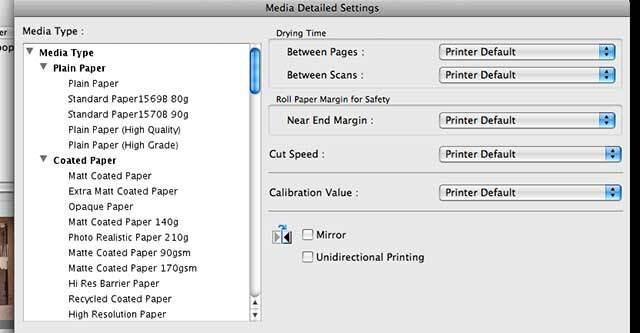 The end of the paper can be marked with a bar code to tell the printer both media type and amount of paper left when the roll is reloaded. The roll holder accepts both 2″ and 3″ cores. Roll length tracking needs to be selected from the control panel and enabled. Move your mouse over image to see the code, as paper is unloaded. For sheet media there is the top loading slot (mouse over image to see). There are movable guides for different paper sizes (A3+ in this case). 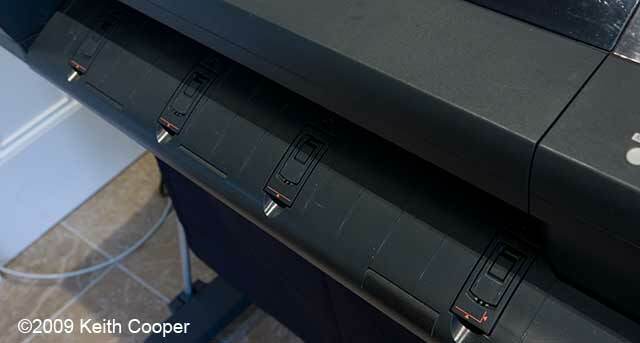 For thicker sheet media there is the front loading slot (mouse over image to see paper guides). 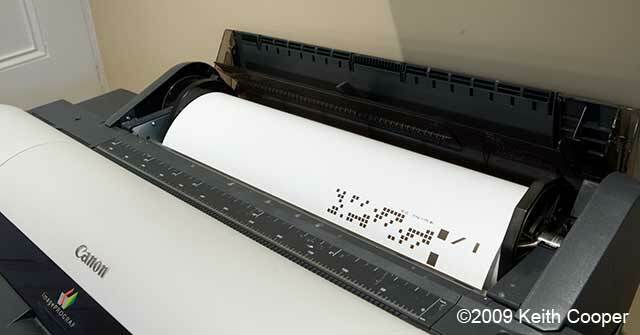 Do remember that the paper path is straight through, so you will need space at the back of the printer if the paper is not going to bang against the wall. The front loading slot was not the easiest to use, and takes several goes to get the knack of just where to put the paper to load correctly. Once this was sorted out, printing worked with no problems from the front load slot. 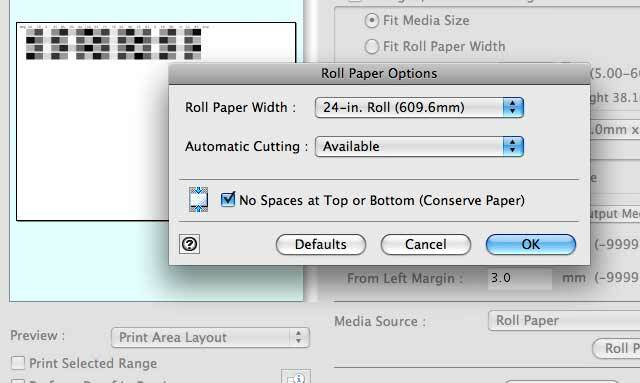 If you try and print with the paper set to the wrong type, then you are alerted to the mismatch. Borderless printing is supported at particular media sizes. The image below shows a borderless print coming out of the printer. 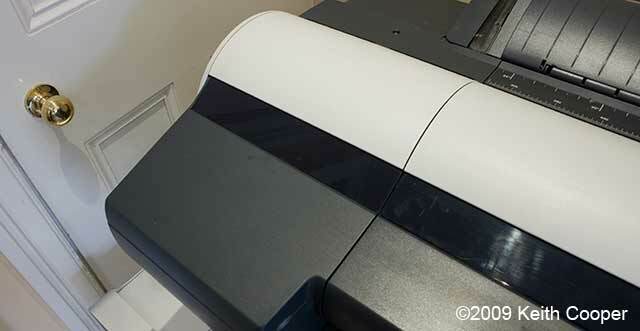 On top of the printer is another print with the parts trimmed off from the top/bottom borders shown. Since I’m a photographer who prints mostly my own work, I’m not running the printer all day long. I’m looking at how this printer performs, foremost in respect of print quality, both for colour and black and white. I’ll cover ink usage later, and have some useful information links for users in a more production oriented environment at the end of the review. 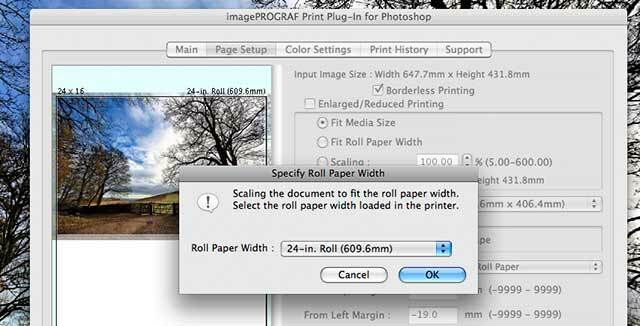 I’d normally print images from Photoshop, after resizing and sharpening for the appropriate print size. 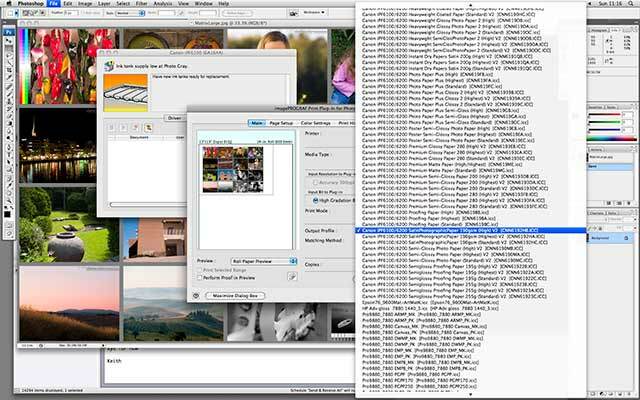 The picture below, shows the standard Mac (OSX 10.5) print dialogue via photoshop CS3. This offers a good range of printing options (the Windows version has similar functionality, but looks different). 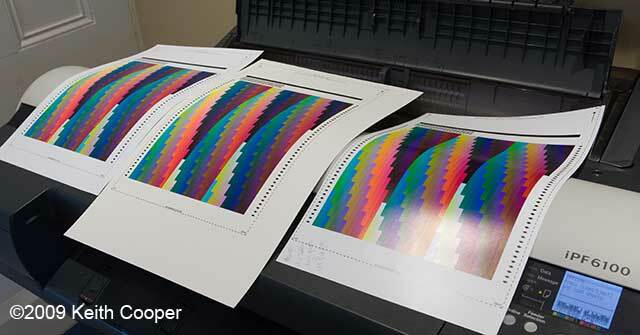 The image I’m printing is the Datacolor test image I often use for doing quick evaluations of colour print performance. 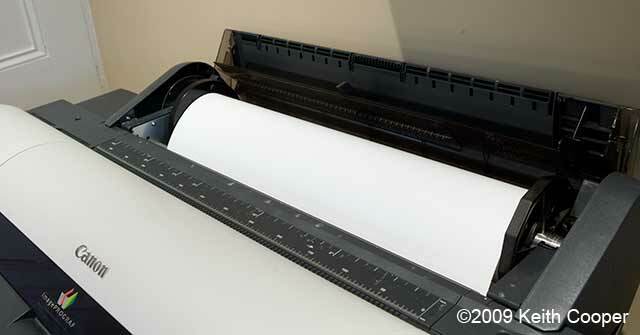 I’m printing an A3+ (13″x19″) sheet size on roll media, which will get trimmed to size. 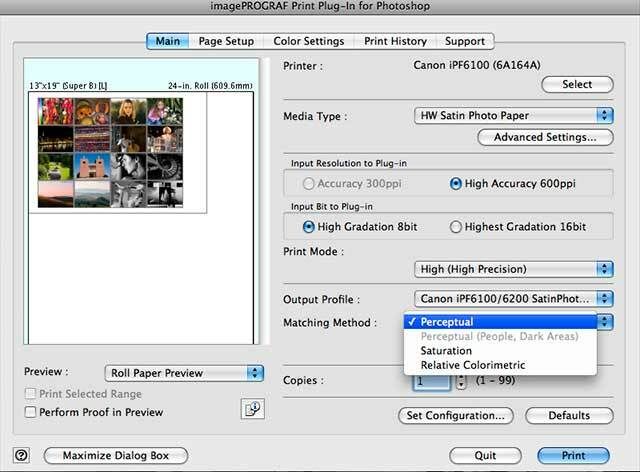 In subsequent screen shots, I’ll be showing the Canon iPF print plug-in for Photoshop. This allows printing, without going through the Photoshop print dialogue. It’s accessed from the ‘Export’ menu in Photoshop. I found that it was easy to use, and in addition, offers a true 16 bit print pathway. That is, the full 16 bit data in your image gets used by the printer driver. Do remember, if you try it out, that many test images like the Datacolor one are supplied as an 8 bit JPEG. I’ll not go through all the driver functionality, but have a selection of screen shots showing some different features. 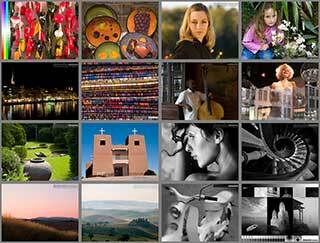 The image you are printing can be viewed in a number of ways. 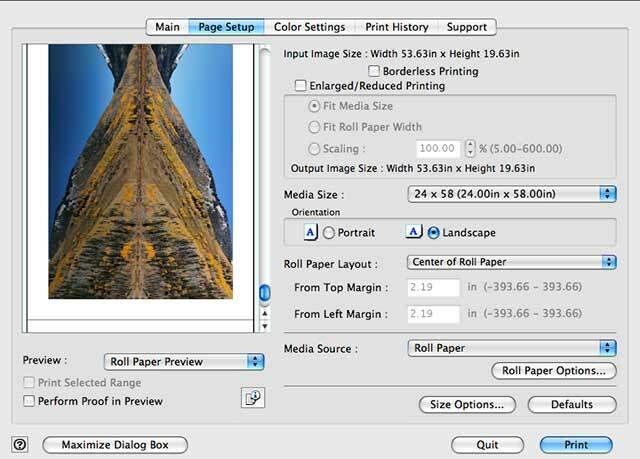 The Print area layout view above, shows how you image fits on the chosen media size. The image view below, shows just the actual image itself. Note that you have the option of showing a proof view in the preview – this uses the ICC printer profile you’ve selected to give an idea of what the print will look like. 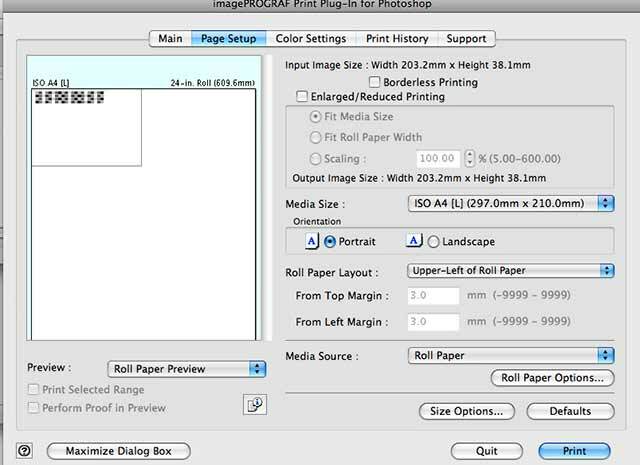 The roll paper preview below shows how the chosen media size fits on the roll paper (24″ Canon HW Satin in this case). 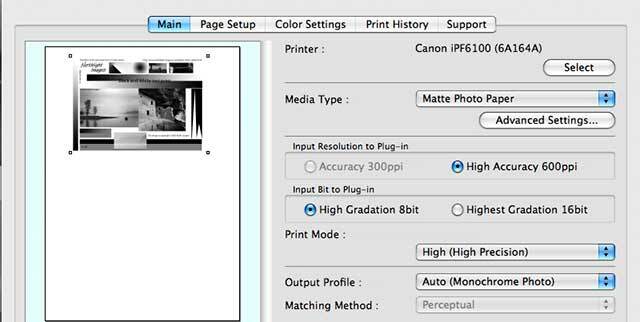 The print mode below, sets the printer’s own resolution. 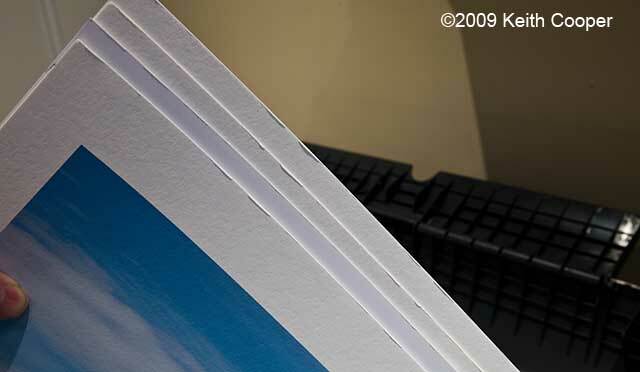 The difference between High and Highest was noticeable in some fine detail when printing on a glossy paper, but at normal viewing distances for large prints was not that obvious. Since I use colour profiles to print, the colour settings page is one that I’d not normally look at at all. However, note the ‘Curves’ button. 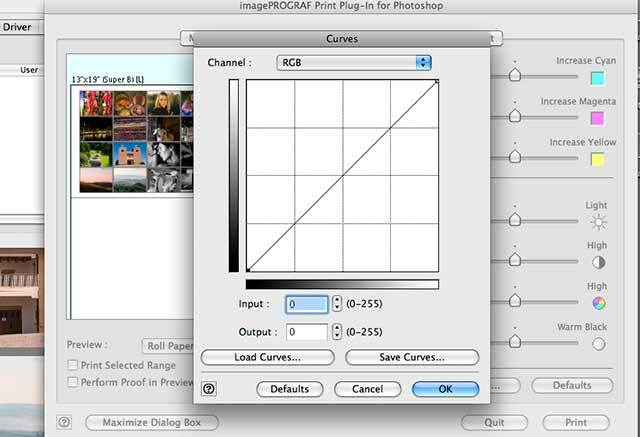 This allows you to set or apply a Photoshop curve file to the printed output. 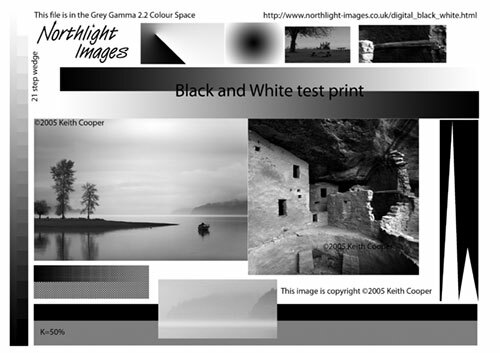 I can’t think of any reason I’d want to do this in the printer driver for colour images, but it did make me think of how to improve black and white prints (covered below). There are a lot of page setup options. These give a great deal of flexibility in media use, but do be careful to check settings – we had several messed up prints during testing, where I’d been in a bit of a rush to print something off. No shortage of available media sizes. In addition, setting your own custom sizes is very easy. One minor gripe is that you can’t re-arrange the display order of any new paper sizes you’ve created. Where it does start to get a bit overwhelming is the sheer number of media types. I’m using a roll of HW Satin paper, which is on the list. To be fair, this list can be heavily cropped using the media configuration tool, but it can be a bit of an effort looking though everything. The driver also allows full borderless printing, with a scaling function to fit the paper size. 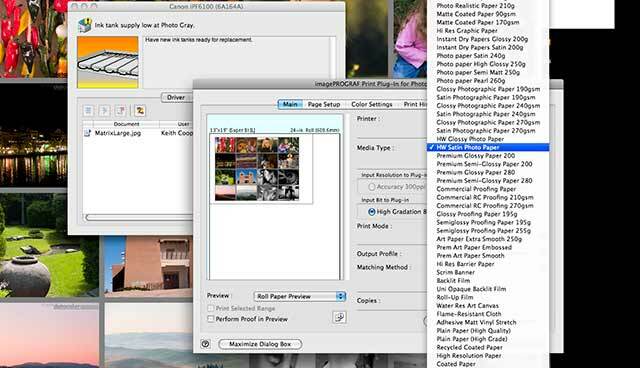 During normal printing there is a handy paper saving option that will trim based on image content. In this instance I’m printing a small black and white linearisation target, which used up all of three inches of roll paper. The print on top of the printer has been auto expanded from an A3+ sized image. The resizing is not as good as I could manage in Photoshop, with for example, Bicubic Smoother interpolation followed by selective print sharpening. Borderless printing is not an option I’d probably use, unless printing for direct mounting of prints on a substrate. For large prints such as the panoramic ones below, I’d normally want a clear border. 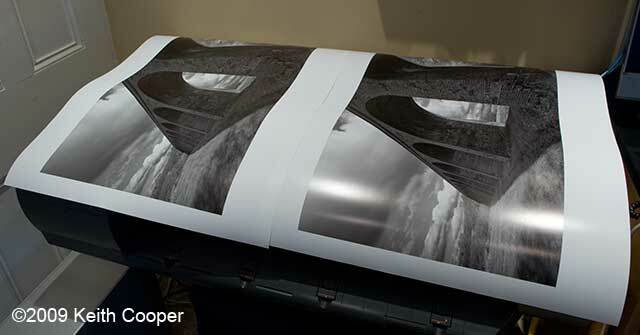 One of the uses I make of big printers and roll paper is to print large panoramic prints. The example image is ~54″x20″ and is a stitched panoramic view of a small lake beside the road from Ouray to Silverton in Colorado. Printing from the plug-in allows me to clearly see how the print will be positioned. Since I want a border, I make sure to deactivate the paper saving mode. Here’s the print on its way out of the printer (it took around 9ml of ink BTW). Small lake on Hwy 550, just south of Ouray, Colorado. 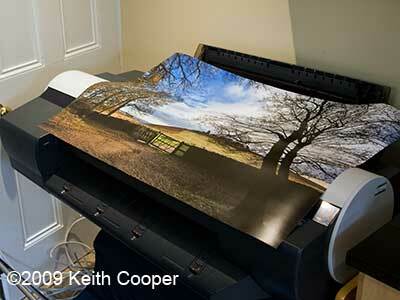 One of Keith’s large panoramic prints. Maximum printable paper length is listed as 18m in the specifications. The printer will inform you that it is short of ink for some time before it actually runs out. You can over-ride the warning on the front panel and continue printing, but eventually it will just stop. Think of the warning lights as reminders to have spare ink carts in place. The printer driver software will also remind you. Each cartridge hold 130ml of ink. The cartridges are lifted out and replaced in seconds. Whilst we didn’t try it, I’m told you can change carts in mid print. Being of a curious nature I decided to see that was in a cartridge. There is a chip which records ink usage information, and the cartridges seem to be physically keyed so as to make their replacement even less error prone. The ink is in the grey plastic case (not in a bag) with two access areas, one of which seems to be for pressure equalisation. Not shown, the mess in the sink when I checked that the cart did indeed contain almost no more ink when flagged as empty. There is also a maintenance tank, which fits under the print area. This gets used up with ink charging, cleaning, and overspray when printing borderless. There are two print heads, with six colour inks per head. The print heads are rated as a ‘consumable’ with each rated for several litres of ink running through them. We didn’t have a printer long enough to require a head change, but it looks to be a pretty straightforward process. The printers run regular cleaning cycles, dependent on both usage (including time switched off) and ongoing self testing. This will use small amounts of ink, so expect levels to gradually drop over time. I did one nozzle check during printing, and it came out fine – there are a number of more advanced alignment and set up options available in the printer menus. This includes calibration where the built in measurement device is used to ensure that the printer is correctly printing at the optimal ink densities. I’ll cover this in a bit more detail when discussing profiling. The printer comes with a collection of software in addition to the usual drivers. There is, as I’ve mentioned, software to alter the media choices you get in the driver, or the printer itself. Given the vast number of paper types available, you might well feel like drastically pruning the list to make everyday use a little easier. The printer has its own web server, which is accessible in any browser. Basic job information is available, along with more advanced configuration options. If you look carefully at the screen shot below, you might notice that all supply levels seem to be in multiples of 20%. This very large value means that you can be looking at a row of ink levels at 40% one minute, and the next they’ve all dropped to 20%. The spurious accuracy implied by percentages really should be fixed, or the values changed to some other unit. More precision is available if you look at the stored job data. Here, you can see precise amounts of ink listed against print jobs. The panoramic print of the lake took around 9ml of ink. The ‘ImageNest’ job is a collection of smaller images printed using the ImageNest RIP for layout (see our ImageNest Review for more info). Do note that the figures only show ink usage on print jobs, not for cleaning. The manual is put together in a helpful manner, and accessible via a browser. If you want a PDF to read, then there is one available for download via the Canon USA site (see info and resources links at the end of the article). 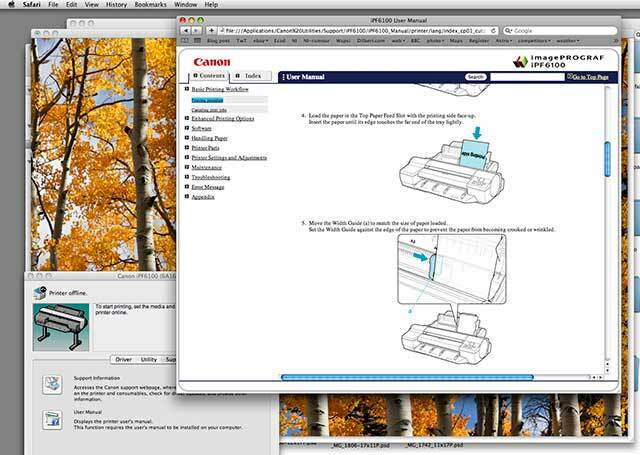 In the example below, it’s been opened from within the printer driver dialogue, where you can also access related Canon information on the web. This allows images to be tiled and fitted onto roll paper. I’m told by an iPF6100 user that it works well for basic use, but is not up to the more sophisticated layout options available with full RIPs. 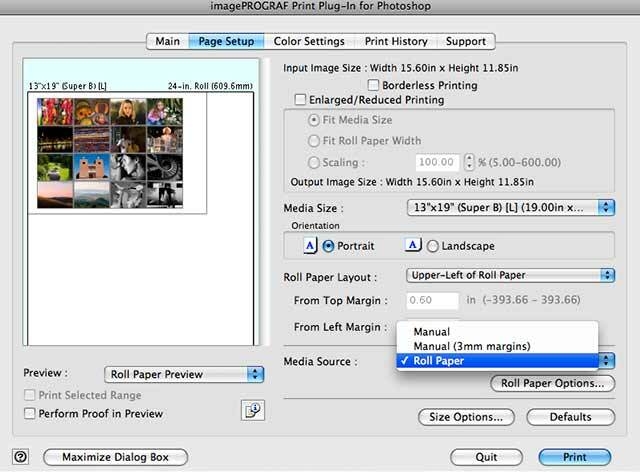 We often use ImageNest for layout, when printing large numbers of images (contact sheets) on roll paper. 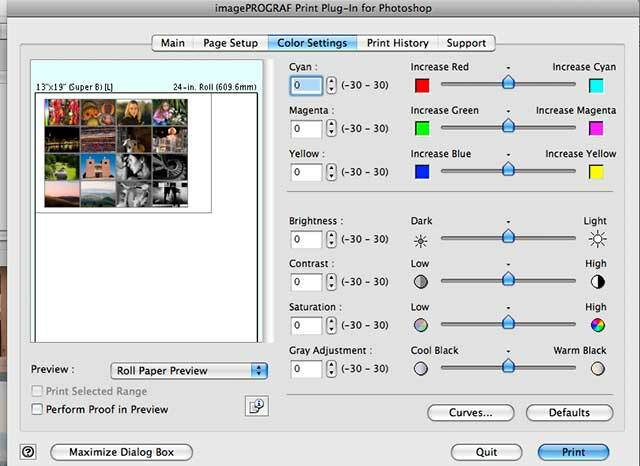 When printing colour images, I always print using an ICC colour profile for the printer/ink/media choice I’ve made. The iPF6100 comes with an impressive collection of colour profiles for the collection of available media choices. Once again, you might wish to prune this collection for everyday use. You can select the rendering intent when printing from the plug-in, as shown above, but there are hidden potential problems here, that I discovered when printing. 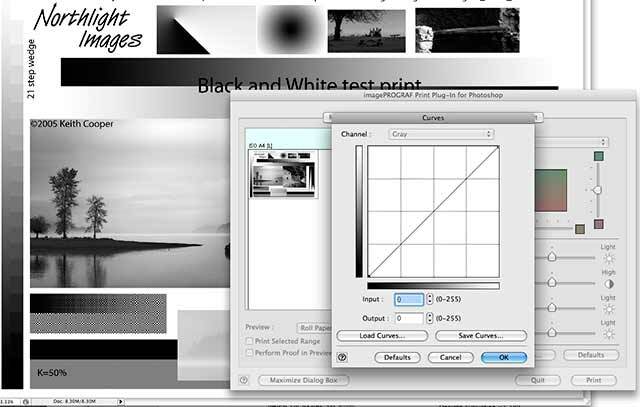 If you print from the Photoshop print dialogue (right), then there is the option of printing with BPC (Black Point Compensation) which opens up shadows whilst matching the black point of the image and the media. For many print combinations, this is worth doing, to the extent that it defaults to ‘on’ in the Photoshop print dialogue. First up, there is no BPC option in the plug-in, and secondly it seems to be applied to the perceptual rendering intent, but -NOT- to relative colorimetric or saturation. 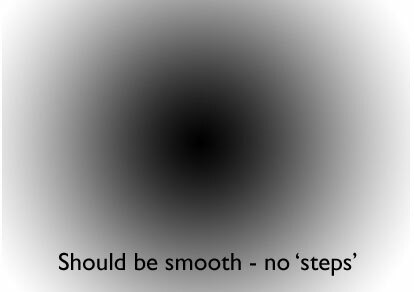 I’ve no idea what ‘Perceptual (People, Dark Areas)’ means, it’s not one of the usual rendering intents. Also missing are paper colour and black ink options found in the Photoshop dialogue. These omissions are (IMHO) a failing in the design of the plug-in, where the absence of any Absolute colorimetric or proofing options also seems a curious omission for a printer at this level. If I want to do proofing and choose rendering intents, then I’d like a bit more control over it. I discovered this when printing the big pano print above – I have a version with darker shadows. If you look at the ink usage, you can see that it took 9.3ml of ink rather than 9.0 – that extra .3ml is enough to make the print of no use. The supplied Canon profiles that I tried produced reasonable results, but after making my own profiles, it was clear that the one for the HW Satin paper I was trying was nowhere near optimum for this printer. After leaving the profiling target to dry overnight, I created a profile. In this instance, I’ve used ProfileMaker Pro V5 and measured the target with an iSis spectrophotometer. For this particular paper, every profiling package I tried produced better looking test prints. This did concern me somewhat, since modern manufacturers’ profiles are generally quite good. I’ve checked this with Canon and I’m minded to think that I might have got an incorrect profile, since I did notice some inconsistency in the naming, although the printer could have just needed calibrating. 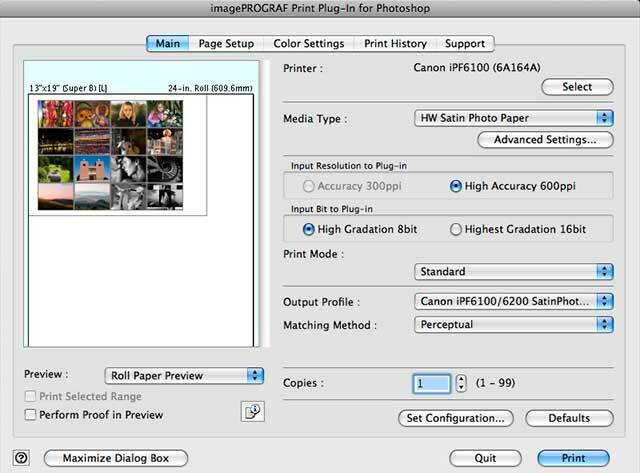 As to calibration, this feature is carried out with certain papers (Canon supply a list), and is designed to return the printer to a known predictable state (i.e. 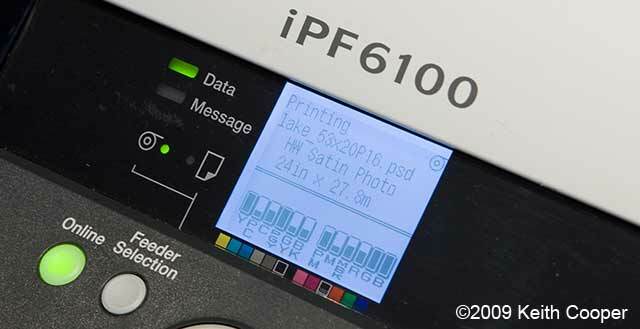 one iPF6100 will print the same as any other – if calibrated). A reliable consistent paper is required for the calibration step, so best to avoid that unknown roll of photo paper you got on the cheap. If I had a new iPF6100, I’d calibrate it after initial setup and testing. I’d certainly remember (next time) to calibrate it before making any profiles. I’ve seen it suggested that another good time to check calibration is as you start running out of your first set of inks, since the heads do ‘settle in’ a bit. It’s the sort of thing I’d put in the diary to remind me to do every six months or so. There are a lot of media settings. What to do if your paper is not listed? I was looking at a heavy art paper that Canon left me with the printer. The only problem was that it wasn’t in the list. You can see some of the options below, and in the fourth photo, what happens when you don’t set the correct media type for what you then choose in the driver. There are a set of ‘Special’ media settings for use with matte and photo black ink – these have defined ink limits and make choosing a media type somewhat easier for colour profiling. I’ll show some more examples when looking at black and white printing, but if you have a particular non-Canon paper you like, then a bit of experimenting with test images and media settings is probably in order. One of the difficulties in writing printer reviews, is that unless you come round to our office and look at the huge piles of test prints, much of what I say about print quality has to be slightly subjective. I’ll not go down the road that some reviewers take with vast tables of data and pretty gamut volume pictures – for these are essentially meaningless unless there is a lot of supporting information to allow you to usefully interpret the data for your own uses. Modern printers at this level all produce good prints, there is really no better way than to get a test print and look at it yourself. 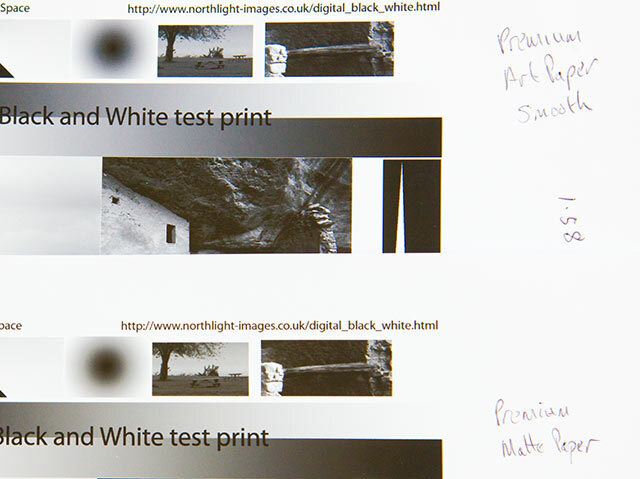 I initially use these two test images below to find the more obvious faults in printer performance (B/W and colour). These test images (and many others) are available for free download on this site. I’ll then try profiling a few papers that I like the look and feel of. Anyone who sells paper will tell you (if they’re honest ;-) that a lot of paper is sold by ‘feel’ – even if it ends up behind glass. Most prints here are on Canon HW Satin, which is a good satin finish paper, if perhaps a trifle thin for my personal choice. That’s for colour prints – what about black and white? 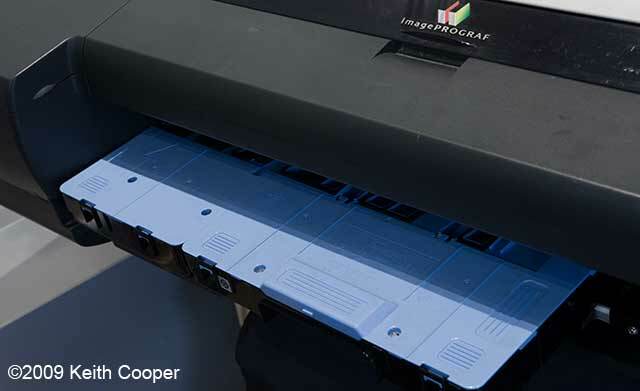 There are two ways you can approach black and white printing on the iPF6100. 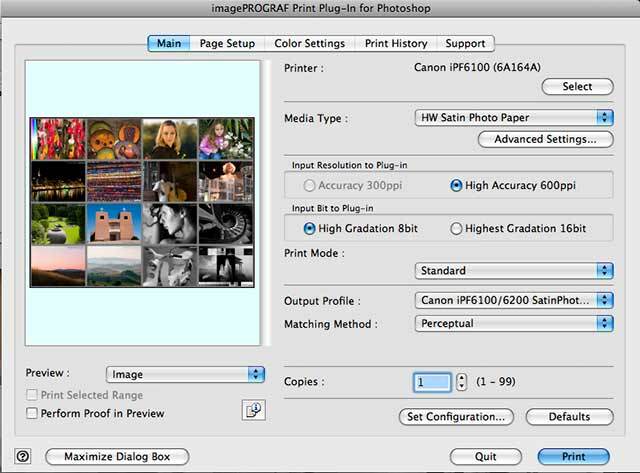 With a good quality ICC profile, you can just print your B/W image the same as if it were colour, alternately you can use the custom B/W printing mode. The first method relies on good profiles, but can be let down if your viewing lighting is unusual. I tried a test print in assorted lighting round our offices, including daylight, a north facing skylight (over 10,000K colour temp) and some of the dreadful energy saving bulbs in corridors and store rooms. There were no obvious issues with the Canon HW Satin paper, so this approach is worthwhile trying, particularly where you have a paper with a distinct colour to it, and have generated a profile with paper relative greys. Note – when generating profiles, some software gives you the option of absolute greys, or paper relative greys. In general, go with the profiling software’s default, but you might want to experiment to see what looks best for your paper. The second approach is to use the specialist ‘Monochrome Photo’ printing mode. This has the advantage of having been fine tuned at a low level to give good B/W results for particular media. 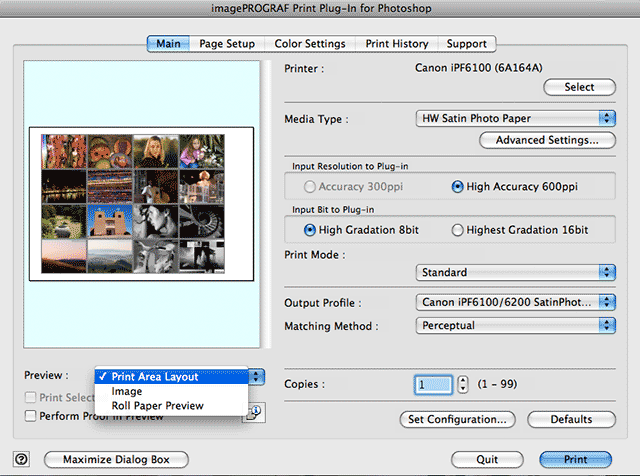 In the view of the plug-in below, I’ve selected monochrome for printing my B/W test image. It’s one of the automatic options. The colour settings tab allows quite a bit of fine tuning for the output. Do remember that prints can vary in how they look depending on paper choice and how they are lit, so be very careful before you start making adjustments to tweak your output. These options can easily make things look worse, I’d personally just use neutral or warm black and leave the other sliders well alone, other than a very slight nudge of the sliders (~ Y+5) to match paper and dim viewing lighting – then again I rarely think toning or tinting adds to a picture, it’s all too often (IMHO) trying to ‘improve’ an average picture. Once again there is the option of applying a curve to the output. Whilst I couldn’t see any real use for this with colour work, for B/W it allows you to correct for non linearity in the greyscale response of the printer/paper combination. Look again at the test image, in particular the circular bulls eye pattern. This part of the test image is the best quick indicator of non linearity in a B/W print. It should be a smooth gradient, right the way to the centre. It’s a very tough test and will show up unevenness and bumps that might not be obvious in many photographic images. For a B/W printing technique to be of use to me, this test is one that it must pass. (it should look even on your monitor too). I’ve written elsewhere (see information at the end of the review) about linearising black and white output with QTR profiles, but the curves dialogue is one place where you could use a custom correction curve. To test for greyscale linearity, I print out a 51 step greyscale wedge. With the paper saving trim option, this used up less than 3 inches of roll paper. 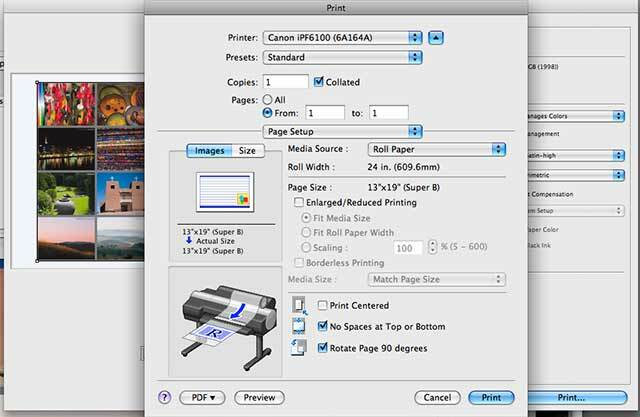 Printing via Photoshop allows you to specify the QTR profile at print time. The correction profiles are most likely to be needed for third party papers that don’t fit any of the standard Canon media types. Media settings choices are vital in getting good profiles, and it’s very good to see a set of ‘special’ media types that you can test. 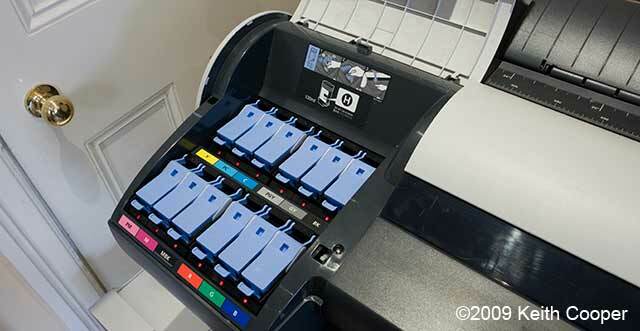 These offer a range of ink limits, so it’s an easy process to print a test strip with different settings to find the ink limit of your particular paper. 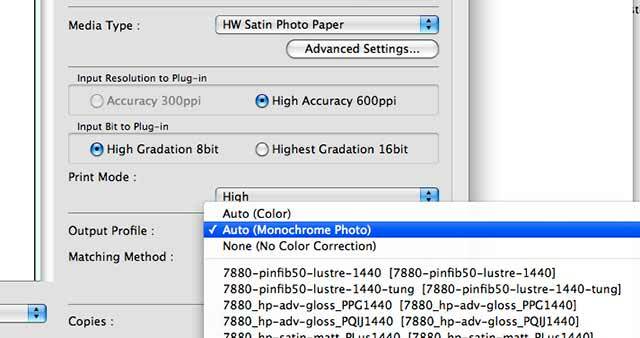 It takes some care in deciding which media setting to use with a new paper, since it turns out that the B/W mode makes allowance for paper colour when printing to a specific media type. I tested a number of black and white media settings on different papers. Here are some of the test sheets. This is viewed under daylight, and shows the difference between the sheets of art paper in the background, and the matte paper at the front. The very white paper is one with a lot of optical brightener (OBA) in it. If I’m making a QTR profile or linearising curve, then I normally want it to do as little work as possible. The overall tone of the inks is different. I suspect that this is designed to compensate for paper colour and means that there is a bit more to do when finding the ‘optimal’ setting for highest quality B/W printing for a particular paper. So, what difference does all this tinkering with B/W curves and corrections make? 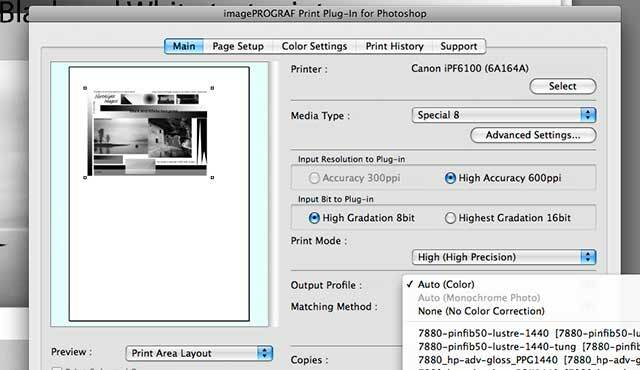 If I have a well set up monitor and print viewing conditions, then I can be pretty sure that what I see on the screen is giving a good indication of how the print will look. I know that if the print is going to be looked at in low light (a restaurant for example) I will have to lighten it, but I can be confident that the image I’m working on is less likely to surprise me when printed. If the printer introduces non linearity, then some of the predictability is broken – my approach to colour management workflow is that it helps me get things right first time more often (but not always!). It’s difficult to show here, but the photo below may give some idea. The print to the left is using Canon HW Satin paper and the default B/W settings. that on the right is the same, but with an added QTR correction profile. The default setting opens up deep shadow a bit too much, which in this instance takes away some of the feeling of depth I’m after. For this particular image I’d actually prefer to print it on a heavy art paper, but the example above shows the effect I’m trying to demonstrate. I like to get the technology ‘nailed down’ and working well – then I can effectively forget about it when making a print. I take the same approach to my photography – once I’m comfortable with understanding the technology, it can take a back seat until the times it’s really needed. Do remember that I’m reviewing this printer from the point of view of a photographer who produces relatively low volumes of prints. For myself, print quality trumps minor running cost differences, and media costs are a relatively small part of my eventual print prices. The final test of any prints I produce when doing testing like this is, would I exhibit one of these prints? When using custom profiles, I’d be more than happy to put my name to several of the prints sitting on the piano. I’d want to take a while longer to try and get the best out of any printer like this, but basically I didn’t come across any show stoppers – colour or monochrome. So, basic print quality is good, what of some of those features Canon emphasise for this printer? Print speed is fine, although I’d use the higher quality settings (slower) for most work. Colour Gamut is very wide, with the extra inks contributing to a good even coverage of colours. I was unable to spot any problems in real world images. The greyscale coverage is excellent both when printing in colour mode and B/W. I didn’t get a chance to really test the calibration system, but talking to some iPF6100 users, it seems to work in bringing any printer variation under control. For myself, this feature is about consistency and quality. The fact that Canon emphasises saving ‘Time and Money’ suggests that this printer is being marketed towards heavier ‘production’ use rather than the lower volume quality market I’m aiming for. This isn’t a problem for me, since I understand which market has the larger sales volume. Fortunately there are more than enough aspects of the printer to appeal to the high quality print maker where print quality is the number one concern. As I mentioned earlier, I’m not actually that bothered if one printer uses 20% less ink than another. 130ml does seem to be a bit low for ink cartridge capacity, but that’s spread over 12 inks, so not as bad as you might think. Ink usage information is both detailed (by print job) and vague (20% increments in the displays of ink reserves) The detailed information also lacks any feedback on how much ink is being used in cleaning operations. I was very pleased in the overall functionality and usability of the driver software, particularly the plug-in. Whilst there is other software supplied, I’m going to be printing from an application like Photoshop/Lightroom or the ImageNest RIP, so it’s the printer drivers and associated setup software that matters. Plug-in foibles include: no control over BPC when choosing rendering intent, and the lack of B/W printing option when selecting ‘Special’ media. I’ve seen it suggested that using the plug-in for profiling and printing at 16 bit will provide slightly better results, but unless you are directly comparing prints under excellent lighting, I’d suggest that most people won’t be able to see the difference. Sheet paper loading worked well from the top loading slot, but as you can see in this obliquely lit picture, the paper feed mechanism had a tendency to grab at paper and damage the edges. For more fragile paper, such as some of the new coated papers, this might be more than something you can smooth over with your thumbnail. I’m told that this shouldn’t happen and I do note that it’s a demo printer that’s been carted round to a lot of trade shows. We make a specific point of not selling hardware, but if you found the review of help please consider buying the iPF6100, or any other items at all, via our link with Amazon. In the UK you could try Park Cameras for a printer (just mention us ;-) – You can request a sample print from any one of a number of Canon large format printers via Sample Print, who offer a wide range of test images and media choices (UK service at the moment). The front loading slot had no similar problems but was a bit prone to loading paper slightly skewed – needing to be sorted out before printing. Roll paper operation was flawless throughout testing, where I unloaded and reloaded differing paper types several times. Borderless printing worked just fine too. There are media permanence tests available for this printer, suggesting a 100yr life for framed prints behind glass. Do bear in mind the inherent difficulties in lifetime testing, but the Wilhelm data doesn’t raise any concerns for the life of any prints I might make. I only had the printer for a few weeks, so was unable to look at longer term reliability and maintenance issues. Ink cartridge replacement was extremely easy. So, would I happily use a printer like this for my own work? I don’t know why, but I’d not really thought of Canon and Fine Art printing at the same time. Perhaps I’d used a few too many of their copiers in offices to make the connection, even though I choose to use their cameras professionally. 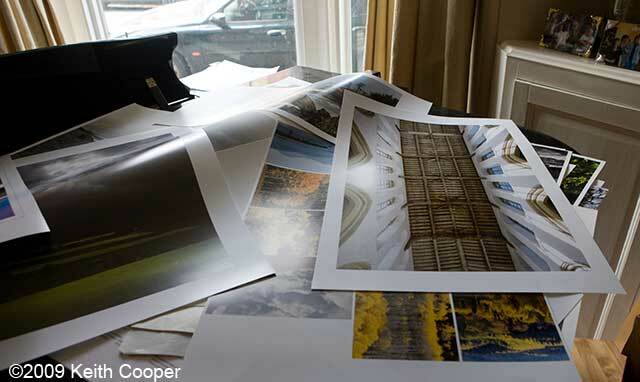 If you want to see test prints, then Canon offer free sample prints via their websites, and in the UK you can request a sample print from any one of a number of Canon large format printers via Sample Print, who offer a wide range of test images and media choices. A nice looking and well built 24″ width printer that makes it easy to produce excellent print quality on roll and sheet media, colour and black and white. A few minor quibbles over some aspects of the software supplied are not enough to cause any problems for my own use of such a printer. 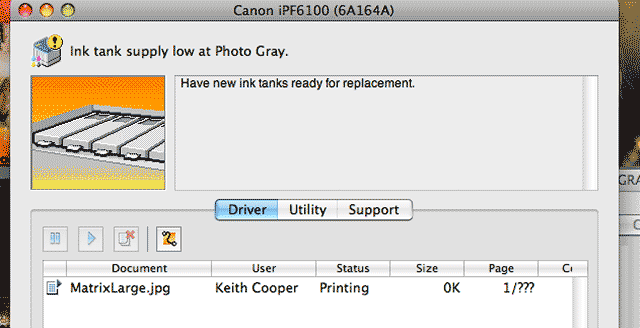 >> Note For Mac 10.6 (snow leopard) users, Canon are saying that the Snow Leopard drivers for iPF x200, x100 and x000 printers will be out by the 9th of October 2009 (possibly sooner). The Photoshop plug-ins should be released at about the same time. The new software will be fully 64 bit compatible. Data-transfer time: 100 / 200 / 400 Mbit/sec. Media Type Roll medias – Standard Paper 80gsm, Standard Paper 90gsm, Matte Coated Paper 90gsm, Matt Coated Paper 140gsm, Extra Matt Coated Paper 180gsm, Opaque Paper 120gsm, Self Adhesive High Resolution Graphic Paper 140gsm, High Resolution Barrier Paper 180gsm, Glossy Photographic Paper 190gsm, Satin Photographic Paper 190gsm, Instant Dry Paper Glossy 200gsm, Instant Dry Paper Satin 200gsm, Glossy Photographic Paper 240gsm, Satin Photographic Paper 240gsm , Photo Paper High Glossy 255gsm, Photo Paper Semi-Matt 255gsm, Photo Paper Pearl 260gsm, Photo Realistic Paper 210gsm, Heavy Weight Glossy Photo Paper 300gsm, Heavy Weight Satin Photo Paper 300gsm, Commercial Proofing Paper 200gsm, Commercial RC Proofing Paper 210gsm, Commercial RC Proofing Paper 270gsm, Glossy Proofing Paper 195gsm, Semi Glossy Proofing Paper 195gsm, Semi Glossy Proofing Paper 255gsm, Art Paper Extra Smooth 250gsm, Prem Art Paper Embossed 225gsm, Prem Art Paper Smooth 225gsm, Scrim Banner, Backlit Film, Universal Opaque White Film, Roll-Up Film, Water Resistant Art Canvas, Flame-Resistant Cloth, Adhesive Matt Stretch Vinyl, Adhesive Matt Vinyl.